Thanks for PlayStation for hosting this video! My Twitter app did right and told me three separate times that the above Dev Diary had been released. I accounts I’m following are : @SuperMGames, @TheDarkPictures, and @PlayStation. Which I didn’t mind at all getting these notification blasts. The video is Part One of Designing the Ghost Ship and I really enjoyed the interviews. The video is barely two minutes and twenty five seconds. Production Designer Lee Robinson, Audio Director Barney Pratt, and Art Director Robert Craig were interviewed. I’m very eager to see what Part Two looks like. I’m already committed that when I buy my wife’s Amazon Christmas presents, I’m throwing in my preorder to the game. I’ll try to caution myself to not get too deep in the weeds but I’m sure they won’t spoil anything in these interviews and teases. I hadn’t heard of any of these prior to the announcement but they sound like pretty fun games. SOMA is a horror game that I’m pretty excited about. OnRush came out in June of this year and looks like a racing game that you try to damage the other cars more than try to come into first place, so Walker Dennis should be a big fan of that game. Iconoclasts is a crossbuy Vita game that can be played on the PS4, it looks like a fun medieval platformer. I’ve been told Papers, Please is super fun on the Vita and now I regret not making a point of going to the online store and making sure I downloaded all of the pure Vita and PS3 games, I have three months left before the PSN Plus no longer offers PS3 and Vita games to correct that. I’ve heard great things about the visual novel, SteinsGate, so I’ll download that and while I’m there, I’ll get Steredenn too. Nice when I copy and pasted his list of the games, it copied over the links, that’s pretty handy for my purposes. I’m starting to try to start speculation about what PlayStation is going to do about the lack of six free games come March 2019. I think what they should do is offer four PS4 games, one from each year : 2014, 2015, 2016, and 2017. I’m sure, like OnRush, that there might be some games they can offer from 2018 but I figure they can definitely find gems that are popular but interest has started to wane. It’ll be nice if they could throw in a free VR game every four months, but I’m not sure if there are enough of those to just toss about. I think it’ll be a truly wonderful idea if, whenever Man of Medan comes out, that month PlayStation offers Inpatient. They already made Until Dawn : Blood Rush a free game back in December 2017. Which is nice as whenever we buy a PlayStation VR, we would have all of these games already. Inpatient is the only Supermassive Game I don’t own but it is hard to justify buying a game for a system I don’t have. Which is true for these Vita games but since I only downloaded the crossbuy ones, I’ve already played them. At least I only missed out on a years worth, I guess I could create a list of which ones I missed out on and if I ever get a Vita, I’ll know which games were the free ones. So only seven games, that isn’t too bad. PlayStation was wise enough to offer several cross buy games and then I was dumb enough not to take the extra step to purchase them through the online store. It would be nice if the PS4 store would just offer me handy links to download all of the free PSN Plus games and not make me go through a different route to get the other games but it is only one additional step and the problem is fixing itself soon. Furmins is $6.49 right now and comes with a bonus world. Zero Escape : Zero Time Dilemma is $39.99 and that’s heart breaking! Draw Slasher is $5.99 and I see there is a Bundle for $5.99 but I can’t tell if the Bundle includes game and whatever else or just added content. The website could be a tad more informative. Space Hulk is typically $19.99 but there is a 40% off right now and is only $11.99. So over all, I’m an idiot to the tune of one hundred dollars! That Zero Escape game being a full price game upsets me. That’s why you always add everything to your library. You don’t need to download everything, just add it to your library and you can download it whenever you like, as long as your membership is active. If it goes inactive, you are just blocked from the games until your membership is renewed and then you pick right up again with your progress. Also, membership stacks, so if you buy a 12 month membership and then see a three month membership discounted, those three months just tack on to your 12 months. Which might be obvious but I didn’t know any of this up to like six months ago. People complain about the quality of games that are given away but just Vita games alone in 2018, half of the ones that were given away for free, are a hundred dollar value right there and we only pay $60. Well, during Black Friday, there was a deal for $40 and that was incredible! Some people bought two and I hope we can be that lucky going forward. Just never worry about it. Which is why I’m trying to speculate on what they are going to do come March when the six free games (two for each system, PS4, PS3, and the Vita) go down to two guarantee games. To justify the $60 membership, I think they should offer two older games (2014/2015) and two newish games (2016/2017/2018) as I’m sure asking for six PS4 games might be asking too much but four seems reasonable. I started with just three but then I remember 2014 was almost five years ago so there has to be a slew of games that can be given away. Membership to PSN Plus also gets you the ability to play multiplayer and access to 10 GB worth of cloud storage space. I use it for the free games and the cloud storage space. I’ll restate, by March, I felt like I had gotten my $60 worth. If you are interested in a nice summary of the games, here are two great videos! Thanks to PlayStationGernade for hosting his video. I really like how he discusses the reviews and his own experience with the games, if he has any. Also a nice benefit is that he plays the trailers and game footage too. Thanks to Platinum Chasers for hosting his video. What I like about Platinum Chasers, and I only discovered his video for the November 2018 games, is that he strictly talks about the trophies. I now know SOMA doesn’t offer a platinum and has one missable story trophy. That’s good to know before launching into the game. Apparently it is one where you have to talk to someone and if you don’t follow the blue lights to green lights to blue lights once you are outside again (I hope it makes sense within the game). I usually like to wait until I earned my first trophy in the game, and then I will go check the trophy list on the PS4. I look at the top one, the two surrounding the first one I earned, and the last one and I try to memorize those ones. Then usually at some point later that night or in the morning, I’ll check to see if there are any missable ones. I don’t usually care about if a game has one or not, it is disappointing but turns out, I have several games that don’t offer a platinum. I’m not even that crazy about getting the platinum or all of the trophies, some games, I just know I’m not going to be able to get several of the trophies and that relieves some stress. OnRush has some multiplayer trophies so that’s nice to know ahead of time. Iconoclasts has a trophy that is pretty grindy, so that’s good to know ahead of time. I’m at Chapter 17 of Uncharted 3 and I keep thinking of Golden Abyss, the Uncharted game that is for the Vita. I looked on Amazon and that game is still $70 and it came out in 2012. So if I ever get a Vita, I want to be able to purchase Golden Abyss too. $210 makes me hesitate, naturally, but maybe a pawn shop would have it for $100 or something. Way too much for me to spend on myself and also too much to ask for it as a present. PlayStation VR, with two games, is still $300 but you can get it for $275 right now. I’m told it isn’t good for five year olds to use it, much less, it probably wouldn’t fit on his head, so I’m probably a year away from legit being able to buy it. I just know that Walker Dennis is going to want to play with it and it isn’t fair to have it if he can’t just play around with it. Plus, it is three hundred dollars! It is still new technology so that makes sense. People who own it love it though. I wished GameStop could offer a demo of it but someone would probably steal it or break it. But the box came in pretty rough shape so we just gave it to him. We don’t have any connection to Ninjago, we tried the first episode of the series on Netflix and it seemed fine enough. I believe he is getting the Lego Ninjago movie for either his birthday or Christmas, so that should be nice and then we’ll have all three Lego movies too. Thanks to Glenn Builds Bricks for hosting the in game video of how to build the Samurai Mech. We like to build it prior to putting it on the gateway so that Walker can play with it when he isn’t playing the game and I don’t have the pressure of trying to build it while the game is active and he wants to be in the World. Thanks legogamesguy for writing a nice FAQ of all of the gold bricks. We are missing two water ones, one needs a Chima person, which Walker is getting, I forget if it is the eagle or the lion. I’m pretty sure it isn’t the crocodile guy but it is probably the crocodile guy. The other water one requires someone to be able to laser gold items underwater, and he isn’t getting the Cyberman so we’re probably not going to be able to get all of the gold bricks. The third gold brick we couldn’t get requires us to get all of the minikits from the Ninjago level of the main game, Elements of Surprise, the third level. We are only missing one minikit and it is in the beginning of the level. We need Chell from Portal 2 which he is getting so that’ll be nice that we’ll be so close to getting all of the gold bricks. See the Portal wall on the bottom left corner? That’s where Chell will open a portal and then open a second portal under the middle snake head. You can barely make out the minikit behind the bars in the photo. 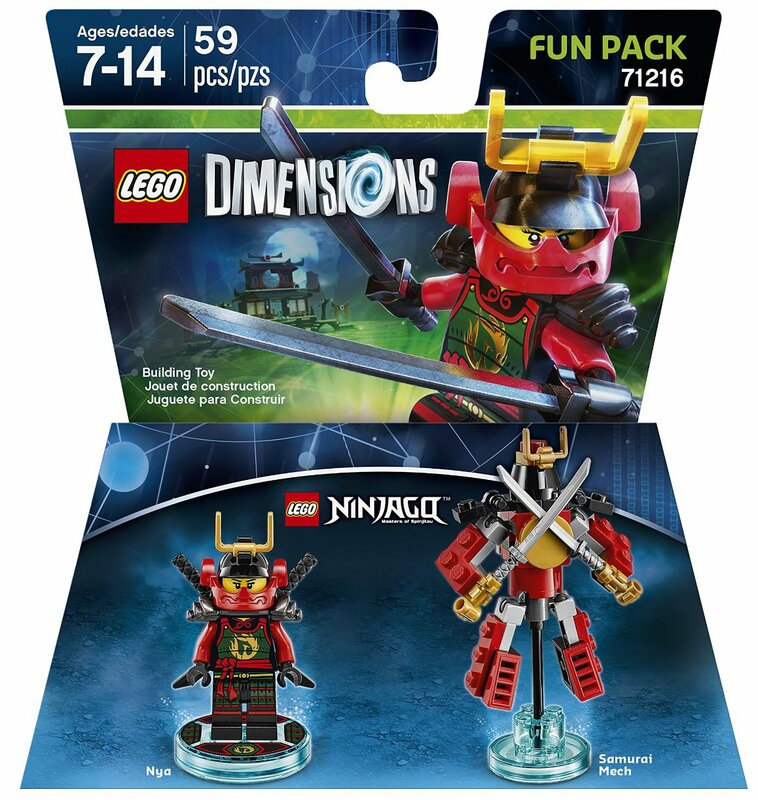 Once we have that minikit, we will quit and save the game, and go back to Ninjago World and activate the mini game there. Is how I imagine it will play itself out. Because of this discovery, I finally figured out which gold brick we are missing from the DC World, as there is a gold brick behind completing all ten minikits in the DC World level, Paint the Town Black, that we’re missing a couple minikits in. It is a work in progress. 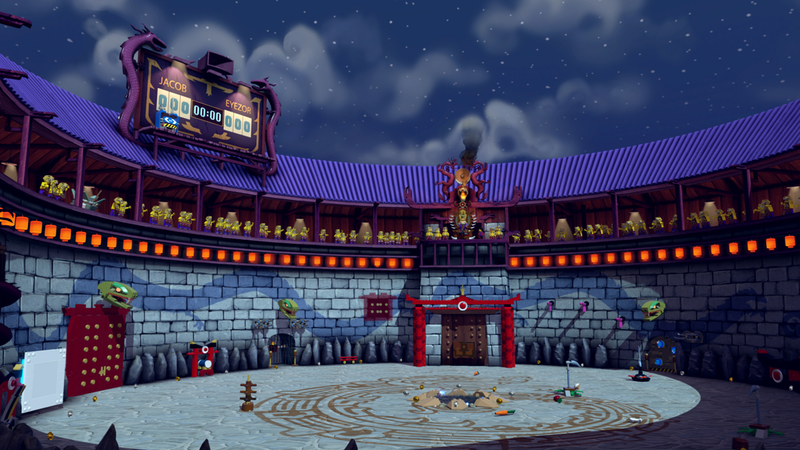 We essentially completed the Ninjago world in two play sessions, which was faster than I thought we were going to do it but we’ve been starved for new content in the game. I wished we were getting Wonder Woman in December as she has mind control abilities and that is one of the missing abilities we need in the DC World and a couple other locations. Sometimes the game would let us rent characters but not in either of those two situations. Happy Tenth Anniversary to my love wife! We made it to ten years!